Navigate the labyrinth of business, political and community networks with a well-connected and respected local whose motto is say what you do, do what you say, and make sure you deliver. The Hunter is the largest regional economy in Australia with a population of over 720,000 people contributing more than $50B GDP annually to the national economy. The region has an estimated 322,000 jobs and this is projected to increase to 384,000 by 2036. The Hunter is strategically situated to leverage proximity to Asia and the region's growing agricultural, health, education and tourism sectors to supply developing Asian economies with resources and products. Click here for more information on the Hunter Region. The Hunter is also fondly known as one of the most parochial regions in Australia with a unique puzzle of business, political and community networks bound by established and strong relationships. Many have found it difficult to un-block the invisible choke points. Until now. Do you have an interest in investing or doing business in the Hunter? Of course you do! Do you want to know how to navigate the labyrinth of the business, political and community sectors of the Hunter Region? Absolutely! The first step to successfully doing business in the Hunter is to be Linked to the Locals…by a local. Navigate the labyrinth of business, political and community networks with a well-connected and respected local whose motto is "say what you do, do what you say, and make sure you deliver". Karen Howard has over 30 years' worth of experience operating at all levels in both the public and private sectors of the Hunter Region. As a respected businessperson, experienced leader and skilled Non-executive director with demonstrated expertise in creating and executing strategy and meaningful communications, Karen is renowned for her capacity to deliver outcomes and provide evidence-based solutions. Read what others have to say about Karen's track record here. At times we all need some constructive, honest feedback. When we talk to ourselves, we don't always get the right answers. Are your strategic and communication plans linked and working? When was the last time you conducted an independent review of your plans? The only surprises we like are at birthdays and Christmas. We say what we do, and do what we say. On time and on budget. If we encounter anything that impacts on this, you'll be the first to know. Discretion and confidentiality. We don't tell the world who our clients are – unless they want us to – then we'll shout it from the rooftops. 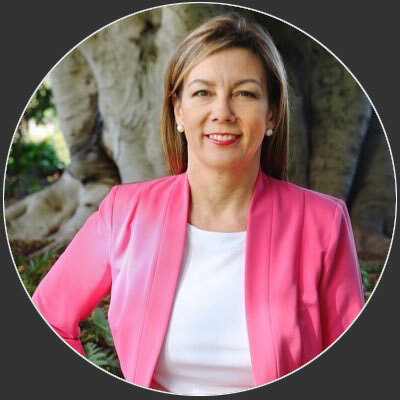 I have known Karen Howard for several decades and can attest that she is a well-connected and tenacious advocate for the Hunter Region. She has built enviable networks and I saw evidence of this during her tenure as President of the Hunter Business Chamber and Chairman of the Hunter Medicare Local. Karen and I worked together on a number of projects and she impressed me with her professionalism and grasp of the political sphere both state-wide and nationally. Karen Howard has shown great commitment to the ex-service community in our area especially to the City of Newcastle RSL Sub Branch and the City of Newcastle Anzac Committee. Due to Karen's influence, we were able to obtain the funding in 2015 which enabled the Anzac Day Committee to build the Newcastle Anzac Flame which has become the centerpiece of the Anzac Dawn service at Nobbys Beach, the best attended (and viewed via NBN television) regional Anzac Dawn Service in Australia. Anyone who knows Karen, knows that she knows everyone, is adept at navigating the various levels of red tape, and delivers results. We're very grateful for her support. President and Trustee, City of Newcastle RSL Sub Branch. Karen and I served together on the Board of the Hunter Development Corporation for five years. Karen is a practical, pragmatic and astute businesswoman with a vast network spanning local, regional and national borders, across commercial and community sectors. She is mature and discrete, tenacious and calm, with a rare ability to find the common ground and bring people together to achieve positive outcomes. We approached Karen Howard for help in obtaining funding for improving the amenities at our well-utilised sportsground in 2016. Karen Howard was absolutely instrumental in the Kurri Kurri Rugby League Football Club (KKRLFC) obtaining $100K worth of Federal government funding to undertake the works. She was tenacious in ensuring that this commitment was honoured and left no stone un-turned. Karen's connections and networks are second to none and we are grateful for her advocacy on our behalf. The project now complete, has greatly improved our facilities for our players, supporters and the number of community organisations that use Kurri Kurri sportsground. The Hunter Region is a parochial area like none other, and that is why it is crucial that businesses wanting to establish in the Hunter avail themselves of the best resource to guide them through the puzzle of political, community and business influencers that make the Region such a special place. Karen Howard is a respected leader in the Region, with local and national networks second to none. She is sensitive to the nuances, discrete and savvy which enables her to achieve real outcomes for those that she works with. During my time as NSW Premier, I had the opportunity to work closely with Karen Howard and have seen firsthand her dedication to the Hunter Region. Karen is a passionate advocate for the Hunter, its people and its businesses, and has a deep understanding of the local communities across the region. I have known Karen for 10+ years in her board, advisory and government capacities. I connected with Karen recently to explore the services and expertise of Veritas Strategies; then promptly engaged her in a Due Diligence and advisory project as part of a business acquisition. Karen's speed, rigour and attention to detail were exceptional. As was her trusted network and ability to connect me with relevant people who layered Karen's advice with specialist geographical, political and planning knowledge across New South Wales. Karen is approachable, transparent and highly regarded throughout the Hunter Region and beyond. I have greatly valued her independent research, perspective and practical advice.